As an independent manufacturer of cabinetry and millwork, Highgate can source its raw materials, hardware, accessories and finishes from a vast array of suppliers. Since all of our work is custom-designed, the end result is really limited only by our client’s imagination and the physical constraints of the available space. We are equipped to work with virtually any natural or engineered materials when it comes to doors, counter tops, shelving, wall units, standalone or built-in seating and work surfaces. 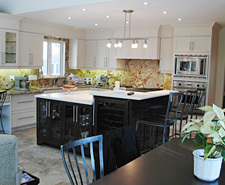 Whether it’s new construction or a major renovation, a family home or a place of business, choosing the right millwork and cabinetry supplier is a critical undertaking. In the first place, projects involving millwork and cabinetry represent unfamiliar territory for most consumers, and that inexperience can be a source of anxiety i.e. “How do I know that the price I’m being quoted is a fair one?“, or “Will I be surprised by a bunch of hidden costs at the end?“. The likelihood that consumers will have to live with the consequences of their decision can make customers uneasy as well i.e. “How can I be sure it’s going to turn out the way I expect?” or ” How do I know they’ll complete the project when they say they will?“. Choosing the right supplier will alleviate these concerns. Highgate has a track history of successful projects, completed on time and on budget, and we’ll backup our record with credible references. We will take the time to understand what it is that you want (and not simply what we’d like to sell you). We will involve you in the design process and show you what the final results will look like before we produce the final product.